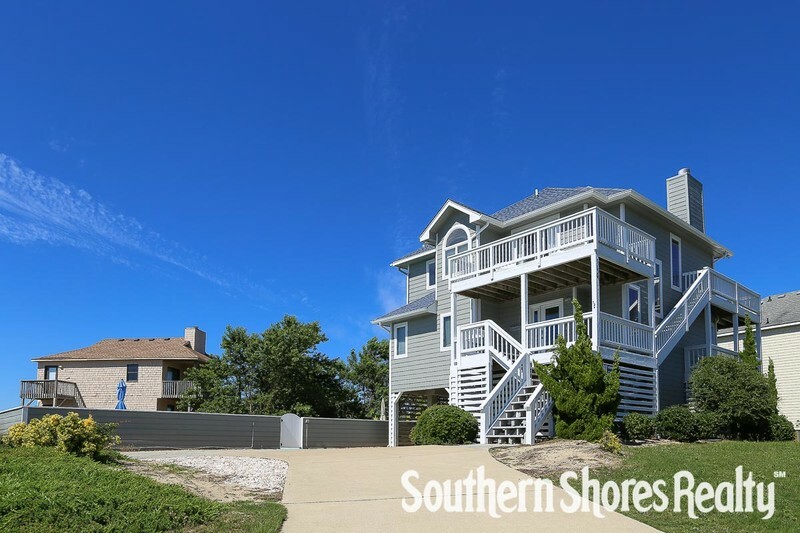 Out of the Blue stands high on the dune, offering broad ocean views, and breathtaking sunsets over Currituck Sound. Relax and read on the shady lower deck, play tennis on the community courts right down the street, or take a refreshing morning swim in the pool. With easy walks to the community beach access, the neighborhood boardwalk to the covered pier on the sound, and shopping in the Town of Duck, Out of the Blue is ideally located for your beach vacation. The large kitchen, family room, and dining area make it easy to spend quality time with family and friends, or you can just turn down the lights and curl up with a good movie. Dry entry area with laundry facilities. Private pool and outdoor shower. Master bedroom (with Queen and TV/DVD player combo, private bath with shower); 2 bedrooms (1 with Queen, TV and DVD player and shared deck access; 1 with Twins, TV and DVD player and shared deck access); full hall bathroom (with tub and shower). Great room with cathedral ceilings and TV with DVD/Blu-ray player will offer you the best of views in this open and bright floor plan! There will be plenty of space for the family to come together! The dining table will provide seating for 8 and a breakfast bar in the kitchen will seat three. Bedroom (with Queen and TV and Blu-ray player with a semi-private bathroom with a jetted tub and stand up shower, has a private deck looking to a view of the sound). Out of the Blue is located in Bias Shores on the south side of the Town of Duck. The Town of Duck provides a perfect place to take a stroll along the soundside boardwalk where you can enjoy many local shops and outstanding restaurants. Bias Shores, an ocean-to-sound community, offers a community pool with poolside refreshment area and restrooms, tennis courts, soundside community pier and a private, oceanside beach access with parking. Book your week in this OBX rental house and start counting down the days to a memorable ocean-to-sound vacation with your family!